Commonwealth is renowned as a leader in the presentation of exquisite food and fine wine with many different catering and beverage options are available. The superb bistro menu is available for members and guests, whilst our comprehensive wine list is first class. 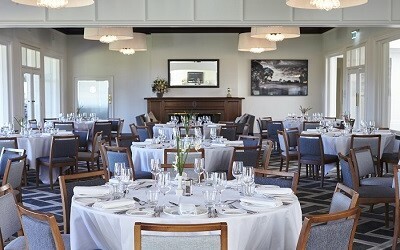 The Clubhouse features a range of unique spaces, whether the occasion calls for formal group dining, a casual lunch, a coffee with friends or some peace and quiet. 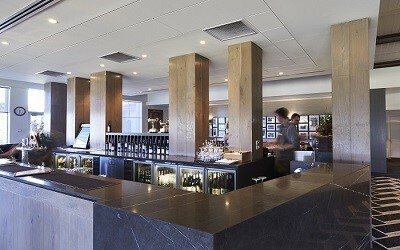 Overlooking the 18th hole, the Member’s Bar and Lounge is a modern space for bistro style dining, with drinks available from the well stocked member’s bar. Our Member’s Dining Room accommodates larger groups for a formal dining experience or cocktail style function, with stunning fixtures, wall art and fireplaces. A popular dining area for golfers to enjoy a sit down meal with AV facilities for post game presentations. The parquetry flooring and spectacular views of the 18th fairway make the Verandah a spectacular area for formal dining for smaller groups. The outdoor Terrace, overlooking the 1st tee, is a popular area in warmer months. Members and guests can order food or drinks from the bar and watch the golfing action from under the large market umbrellas. The Edgar Room, named after 19-time Commonwealth Club Champion W.A. Edgar, is a smaller space suited to private dining, smaller cocktail functions, meetings or presentations. The room overlooks the 9th green and is a popular area amongst Commonwealth members.